Rely on AQHI Inc. for safe and thorough asbestos ceiling removal in Canoga Park CA. Whether you call them popcorn ceilings, cottage cheese ceilings, or acoustic ceilings, these textured materials are just plain ugly. But that’s not even the biggest problem with them. They can also be deadly. Asbestos was a common ingredient in these kinds of ceilings for many years due to its fire-retardant properties. As the ceiling ages, tiny asbestos fibers may break loose, lodge in your lungs, and cause lung cancer or mesothelioma. Get professional asbestos ceiling removal in Canoga Park CA from AQHI Inc.
Asbestos content: Even if you want those ugly ceiling bumps gone for purely aesthetic reasons, you should still get an asbestos test to see what they are made of. 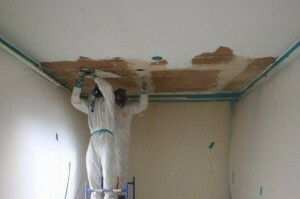 If you are lucky, they may not contain asbestos in all in which case your cottage cheese ceiling removal in Canoga Park CA will be much simpler. Present condition of the material: So long as asbestos-containing materials are intact, there is no way for harmful fibers to escape and pose an active health threat. Therefore damaged ceilings should be removed immediately, but if your ceiling is in good condition you may not actually need to remove it right now. Whenever you tackle a project involving asbestos, you need a certified contractor. This is especially true when cottage cheese ceiling removal in Canoga Park CA is involved. At AQHI Inc., we hold multiple different certifications qualifying us to complete even the most complicated asbestos removal jobs. We have what it takes to complete your asbestos ceiling removal in Canoga Park CA properly to leave your home in safe condition. At AQHI Inc., we treat every property with the same care we would expect for our own home. We pledge never to cut corners in the asbestos removal process but instead provide superior work and leave your property hazard-free. Contact us now to learn more about our services and/or get a quote on asbestos ceiling removal in Canoga Park CA. Our asbestos removal office for Asbestos Ceiling Removal in Canoga Park CA is open Monday through Friday between 8:00 AM and 5:00 PM and closed for lunch from noon to 1:00 PM. With advance notice, projects can be scheduled for weekends, early mornings and evenings.